Flickr Images from Badgermike. 2009 Nissan GT-R in Arizona. 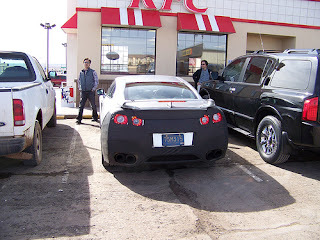 The Japanese sure do love some KFC. They drove all the way there from Japan in the new GT-R. They must have really wanted some KFC. They ate at the McDonald's next door! Thank you for your interest in my spy shot of the Nissan GT-R.
“Do link back to Flickr when you post your photos elsewhere.